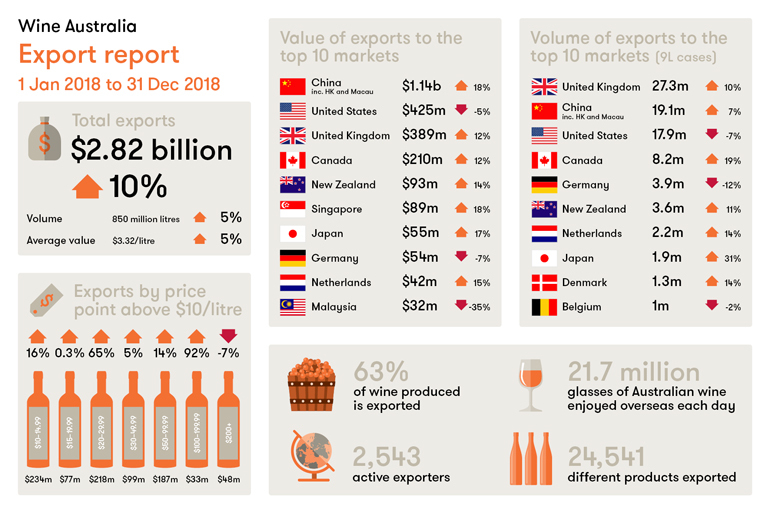 There was a strong demand for Australian wine overseas in 2018, with an increase in wine exports of 10 per cent in value to $2.82 billion. Bottled wine shipments increased by 7 per cent in value to $2.24 billion and decreased in volume by 3 per cent. This saw the average value of bottled wine grow by 10 per cent to a record $6.20 per litre FOB. “These figures demonstrate strong international demand and they highlight how Australian wine exporters have worked diligently to develop and maintain international markets”, Andreas Clark, CEO Wine Australia said. Unpackaged wine reached record levels in value and volume. The average value of unpackaged wine continued to grow, increasing by 14 per cent to $1.17 per litre. Red wine continues to be the most popular wine style exported from Australia, and value increased by 12 per cent to $2.14 billion in the year ended December 2018. The value of white wine exports also grew – by 10 per cent to $607 million. There was growth in Australian exports to nearly every region of the world last year. Exports to North America are starting to level out after more than 12 months in decline. The value of exports to the region declined by 0.1 per cent to $636 million. Northeast Asia grew by 19 per cent to $1.23 billion, Europe grew by 7 per cent to $615 million, while Southeast Asia grew by 3 per cent to $171 million.